A few days ago I was deep in the usual end-of-quarter mire of essays and tests. The first such occasion for feverish grading during the school year brings the sourest batch of stress and despair. At least at the end of the second quarter there is a milestone—halfway!—and mid-year exams signal a leaving-behind, a moving-on to new material. At the end of the third quarter, well, the snow is melting and we see the homestretch, so there is hope beyond the mountain of dried wood pulp. And of course the end of the year brings with it liberation, and grading is almost a joy. But the teacher who assigned too much at the end of the first quarter (and who doesn’t?) knows a darkness that he would not wish on his worst enemy. There’s no sweetness that accompanies the heave-ho of grading then, for with three quarters to go, where is the relief? So there I was in that dark wood, grading feverishly and trying to forget, for a moment, the daily worries and stresses we all carry, and failing miserably at both. My hand was cramped and my head throbbed. I felt like I was hacking away at thick underbrush with a plastic spoon, getting more and more disoriented the harder I tried. It was in the midst of this that my daughters found my hiding spot and started whining at my leg, as they are apt to do when they have run out of ideas for playing on their own, or they are tired, or hungry, or any number of less-than-ideal circumstances arise. I realized that I might explode if I tried to ignore them, so I stopped working and suggested that we read a book. Anything, I thought, would be better than this. What the book was I don’t exactly remember. 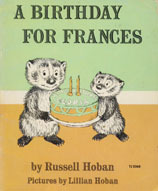 It might have been A Birthday for Frances (the beloved badger). But I do know that I was suddenly struck by how liberating reading the story was. Not this particular tale, but the simple act of it. I had stopped trying to hack my way out of my dark wood and, for twenty minutes, nothing else mattered except for the demands the story placed on us, on me, the reader, and my daughters, who had stopped whining and were listening intently, one at my side and one fiddling with something on the floor. When we read a story, or watch a play or movie, we have no choice in the movement of the plot, the decisions the characters make, or the unwritten rules that govern the world the author has created. We don’t have the job of making meaning, at least not in the same way that an author does. Our task is interpretation, not creation. The author has done all of that work, which allows the reader to inhabit the story, not to fret over making decisions about what will happen in it and how it will mean. To put it rather lit-crit-cryptically,while we are immersed in it, narrative releases us from the burden of being the architects of our own significance. I had been thinking about stories, and their importance, quite a bit in the ramp-up to the end-of-quarter grading binge (probably as a way to distract myself from it), and I’m sure this fueled my realization while I was reading to my daughters. Whatever the reason, everything fell into stark relief. At once I saw two worlds. In one I was burdened with creating meaning through my own decisions, whether those decisions concerned the grade I was going to give the paper in front of me, the repair we were going to make or not make on our car, or the school that would be best for our daughter to attend. In the other world, the world of narrative, I was unburdened by these kinds of choices; instead, I gained freedom by submitting myself to the rules of the story I was reading, by allowing the particular demands of the story to dictate how I read it. The character’s tone of voice required a certain inflection (now that I think of it, it was surely Frances), the various exchanges between the badgers called for slowing down and speeding up at different points—in short, to inhabit the story fully, I had to submit fully to it. I wasn’t reading Shakespeare, of course, but it wouldn’t have been that different if I had been, for all narrative operates in the same basic way. The soul does not love like a creature with created love. The love within it is divine, uncreated; for it is the love of God for God that is passing through it. God alone is capable of loving God. We can only consent to give up our feelings so as to allow free passage in our soul for this love. That is the meaning of denying oneself. We are created for this consent, and for this alone. As Weil points out, submission is at the heart of the spiritual life, for the radical nature of Christian love demands that we accept God’s will and deny our own. A world predicated on the desires of the self is ultimately a false one, as Christians see it. A Christian education, therefore, must foster the ability of students to listen for God’s will, to recognize it, and to accept it. Easier said than done, of course. But this kind of encouragement must begin with removing students from the center of their own universes, with unburdening them of the obligation of forging meaning through their own desires. It starts, in other words, by habituating our students to the workings of narrative. At the heart of narrative resides the notion of parts and wholes. A moment in a plot, or an individual character, or a distinct action only achieves meaning in relation to the entire story. I wrote a little bit about this in my post on Christian Wiman’s memoir, where he struggles with two competing ways of making meaning: one which examines and analyzes, which I identified as poetic, and one which accepts that meaning lies outside of the self, which I called narrative. Reading stories trains us for Christian love by habituating us to relinquishing responsibility for creating meaning. I think this is true both for the reader and also the characters in a story, who are carried along by the larger designs of the author, the irreversible necessities of the plot. Stories ready us for inner transformation by demanding that we submit, if only for a time, to being carried along in a larger design. To surrender to Christ, to love, is to inhabit a narrative—the most meaningful one, we believe. It’s essential that our students encounter them, for how else will they learn to recognize, and to accept the parameters of, the only story that matters? It may seem strange that I’m arguing for the importance of reading stories. Isn’t this what English class is all about? Reading Homer and Shakespeare and Austen? Why does it need defending? Unfortunately, as American schools grow more data-driven and streamlined in many ways (e.g. the Common Core), literature seems less and less relevant, and in fact gets pushed to the side. Public schools have turned their focus to improving reading comprehension and writing skills, which are atrocious and have been in decline for decades, and as a result, English classes are now filled with readings that are suitable to analysis—speeches, historical documents, informational texts, etc. Literature, which used to be the foundation of high school English and Language Arts classes, is now starting to resemble something like an accessory to the main goal of improving language skills. Catholic schools are not obliged to follow the direction of public education, but many do so by default, and the mass-market textbooks (which I have railed against before) that are now aligned with the Common Core are often the ones Catholic schools use. I plan to write more about this—hopefully soon, but right now I’ve got about all I can handle with duties at school. I hope that this will prove to be a preliminary post, a belching out of my initial thoughts on this issue, which will become clearer to me as I mull it over. Send me your ideas about all of this!